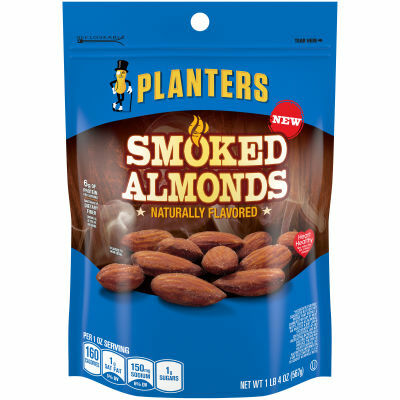 Planters Smoked Almonds - Planters Smoked Almonds are delicately smoked, leaving a natural flavor and deliciously crunchy texture. Healthy snacking doesn’t have to be boring. Spice up your day with a handful of these Planters almonds, smoked to perfection. - A Savory Snack You Can Feel Good About - A good source of dietary fiber, these naturally flavored smoked almonds are a great addition to your salads or desserts, as a side dish, or an afternoon snack. When you're craving a crunchy snack, reach for Planters Smoked Almonds in a convenient 20 oz. pouch. Serving size 1 oz (28g/about 27 pieces).